Located at Telegraph and 17th St. Also has an entrance on Broadway. Didn't notice it until I looked up. Submitted as a Weekend Reflection. This is my first submission to Skywatch Friday. Hope I did it right. Looking east today from Mt. View Cemetery. Taco trucks like this dot many corners in East Oakland, especially on International Blvd. For a buck and a quarter you get a tasty taco with radishes and pickled carrots on the side. Crowds gather at lunch time. This truck claims to be the first (1985) in Oakland. After taking this photo I was feeling a little peckish. My taco de carne asada was very tasty. The Aloha Bar at Fruitvale Avenue and the train tracks below E. 12th St. Yes, these really are the colors it's painted. Their slogan is "the longest bar and coldest beer in town." And no, I haven't been inside to verify these claims. But there's always plenty of vehicles parked outside. These bottles on a window sill caught my eye. It wasn't until later I saw what the camera captured. Can't decide if I like it or not. This is one of the graceful details on our City Hall. This frieze celebrates California's agricultural abundance. Taken from Mt. 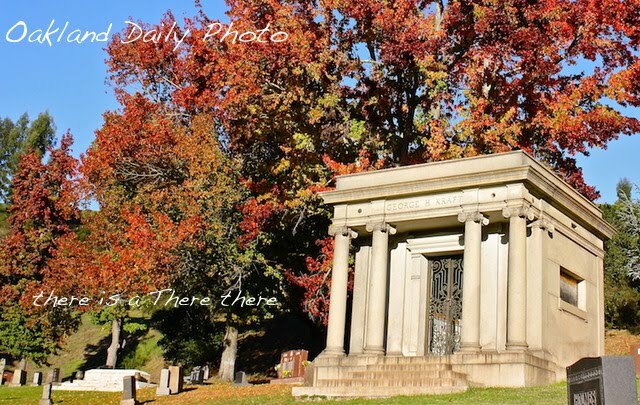 View Cemetery near sunset. Looking toward Marin County. 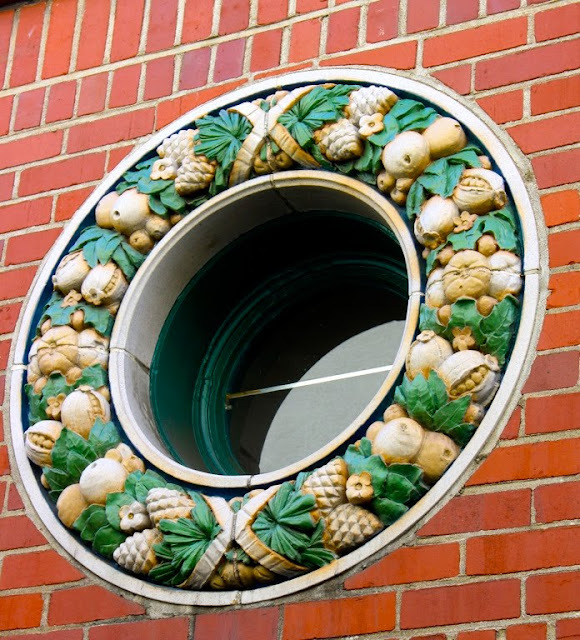 These round windows decorate all four sides of a small retail building on Piedmont Avenue built in 1916 by architect Julia Morgan. For some reason they remind me of a cross between Art & Crafts design and della Robbia. The building is now home to a popular Italian deli, an upscale take-out restaurant, a Mediterranean restaurant, and lucky apartment dwellers upstairs. 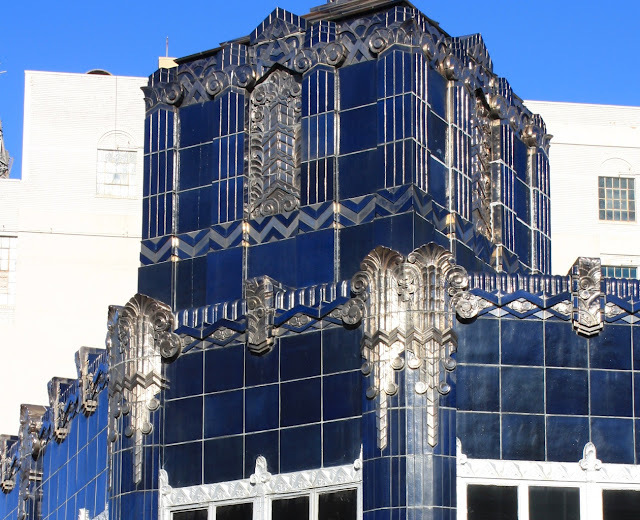 Uptown Oakland has a number of deco era buildings. This was the old Floral Depot which has been converted into the popular restaurant Flora. Located at 19th & Telegraph. Don't even think of coming without reservations. Photo taken before the rains came. Founded in 1915 by the Portuguese community that worked in the nearby cotton mill. 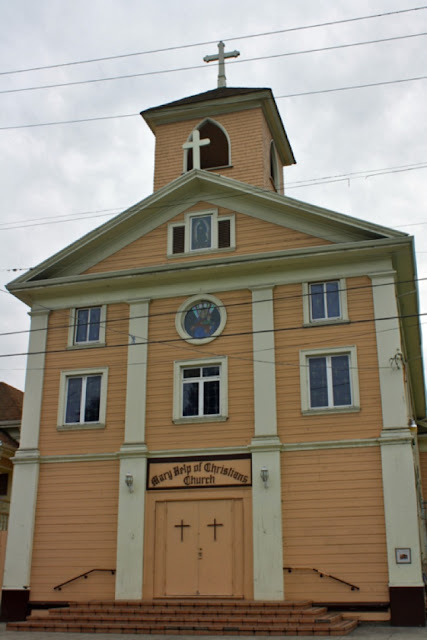 This small clapboard church in the Fruitvale district continues to serve the local community. It has a small park next door and a freeway in its backyard. 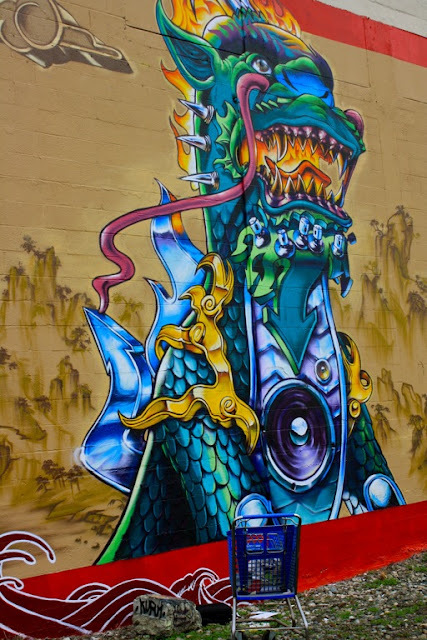 This mural (only part of which you see) was painted last year on the back of a large warehouse which faces the 880 freeway. I like the mix of styles between wild animation and traditional Chinese scroll paintings. The folks who designed and executed it gave it a lot of thought. Taggers have left it alone but the same cannot be said for the train cars that stand near the mural. 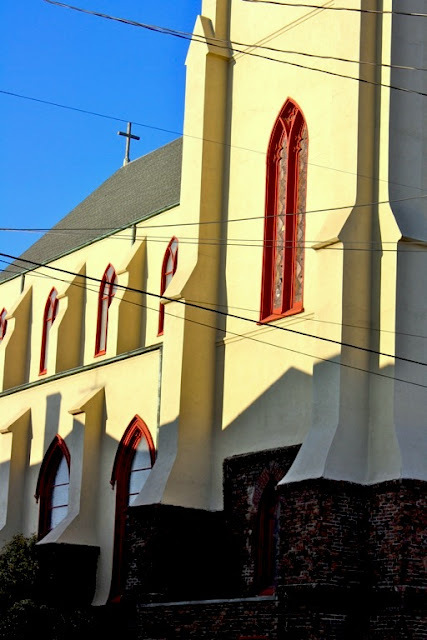 Old Catholic church on the edge of Old Oakland. Now offers services in several languages. Oakland is said to have 100 language groups within its borders. Here's a local mural capturing the same spot as yesterday's photo. Can you tell it was sponsored by a veterinarian? Located at Broadway and Pleasant Valley. The artist is Steffan. 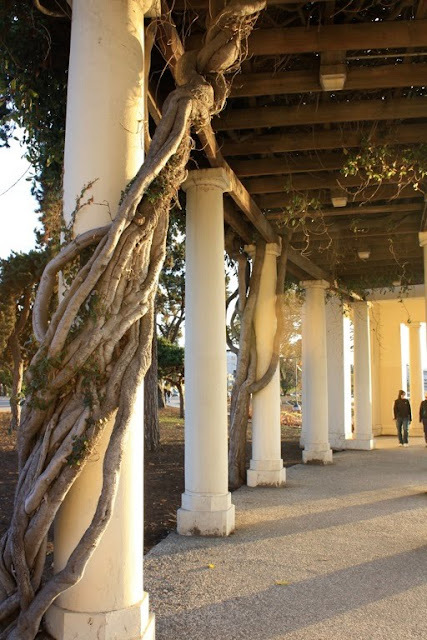 This colonnade is at the east end of Lake Merritt. In the spring the wisteria blossoms hang heavy on these old vines. Heinolds' has been here at water's edge since 1883. Jack London Square now surrounds it. It's a funky old establishment where a cold beer goes down well on a hot day. Jack London visited here often and wrote about it in John Barleycorn. His Klondike gold mining cabin is reconstructed next door to the saloon. There's a very nice walkway just outside of the photo frame which takes you along the marina and to Shoreline Park. Some years back Oakland renovated and preserved a four block area of downtown off Broadway, now called Old Oakland. These buildings predate the 1906 earthquake and represent the intricate architecture of the late Victorian era. A number of popular restaurants are here but many retail spaces remain empty. There's also a Farmer's Market here once a week. Three blocks north is Preservation Park, where many Victorian homes were restored and are now used for weddings, meeting spaces, and offices for local nonprofits. Artistic and scary image. This Harley had it all, down to the chrome pipes, tricked out wheels, and speakers blaring rap. It looked like it was going 80 miles an hour just standing there. The owner laughingly agreed. A very cool ride. 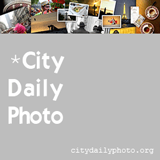 Photographed in Uptown--Broadway and 19th St. Check out the Dragons' website. Found near Shoreline Park in west Oakland. On the border between Oakland and Berkeley stand two iron sculptures with "THERE" denoting where Oakland starts. What does Berkeley's side say? "HERE," of course. 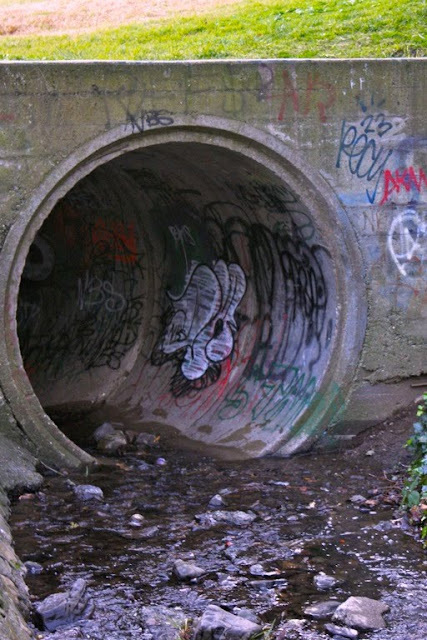 It's actually pretty funny even if it is a sideways diss of Oakland. It's a sly reference to Gertrude Stein's supposed comment about Oakland that "There's no there there." But honest, folks, she wasn't referring to her hometown, but rather to the fact that her childhood home was no longer standing in the old neighborhood. The elevated structure in the background is the BART metro system. A scene along the Port of Oakland in West Oakland.